You can import an Oracle Integration Cloud Service archive file into an Oracle Service Bus project in Oracle JDeveloper. The archive file can include a map file that is largely complete in content or a map file that is empty of content. This action enables you to perform advanced XSLT tasks (create variables, use templates, and so on) in Oracle JDeveloper that you cannot perform in the Oracle Integration Cloud Service mapper. After you complete these advanced tasks in Oracle JDeveloper, you can save and re-import the map file into Oracle Integration Cloud Service. See Exporting an Integration for instructions on exporting an integration that includes the map file you want to edit in Oracle JDeveloper. Create an Oracle Service Bus application with a project in Oracle JDeveloper. In the application navigator, right-click the Oracle Service Bus project and select Import. Select Service Bus Resources, and click OK. 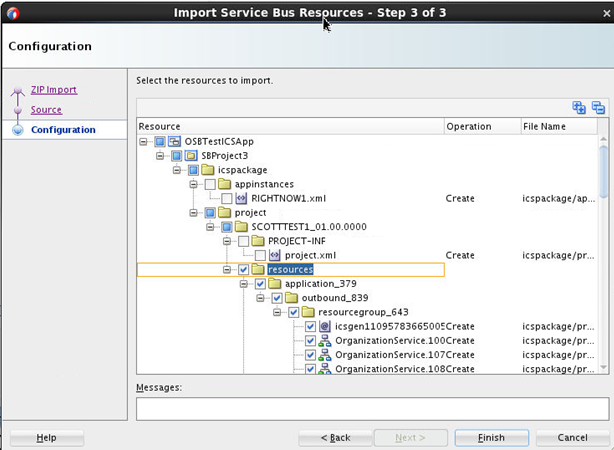 The Import Service Bus Resources wizard is displayed. Select Zipped/Archived Resources, and click Next. Click the Browse Zip Source icon to the right of the Zip Source field. 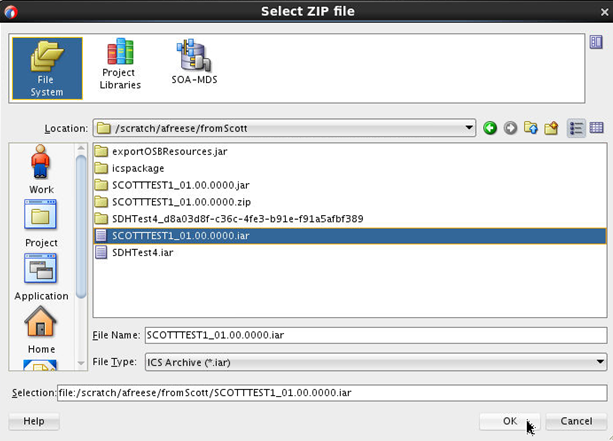 The Select ZIP File dialog is displayed. From the File Type menu, select ICS Archive (*.iar). Browse for and select the Oracle Integration Cloud Service IAR archive file that you previously exported. Ensure that you first rename the .iar file extension to .zip. Browse for and select the ZIP file to import. Click OK, then click Next on the wizard page. The contents of the JAR file are displayed and can be selected for import. Select the resources folder in which to import the archive file. Note that the entire Resource tree is selected by default, including everything above the hierarchy node that you want to select. Ensure that you deselect the parts above the relevant hierarchy node, then click Finish. The resources are imported into the Oracle Service Bus project. You can now open the map file for editing with the XSLT Map Editor in Oracle JDeveloper.